MMV is a leading product development partnership (PDP) in the field of antimalarial drug research and development. 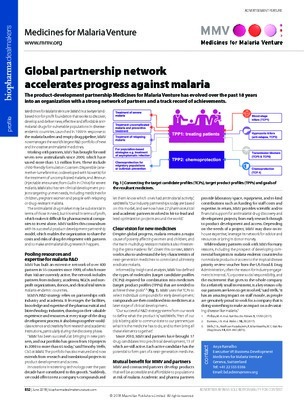 Its mission is to reduce the burden of malaria in disease-endemic countries by discovering, developing and delivering new, effective and affordable antimalarial drugs. Since its foundation in 1999, MMV and partners have developed and brought forward seven new medicines which received WHO prequalification with MMV’s support. Furthermore, with MMV support, Cipla’s rectal artesunate (RAS) product was issued a 12-month authorization for procurement by the Global Fund Expert Review Panel (ERP), while regulatory/WHO prequalification review is ongoing for the same product as well as that of Strides Shasun. In addition, MMV has taken over the stewardship of two approved artemisinin combination therapies (ACTs) developed by Drugs for Neglected Diseases initiative (DNDi) and partners – artesunate-amodiaquine (ASAQ) and artesunate-mefloquine (ASMQ).